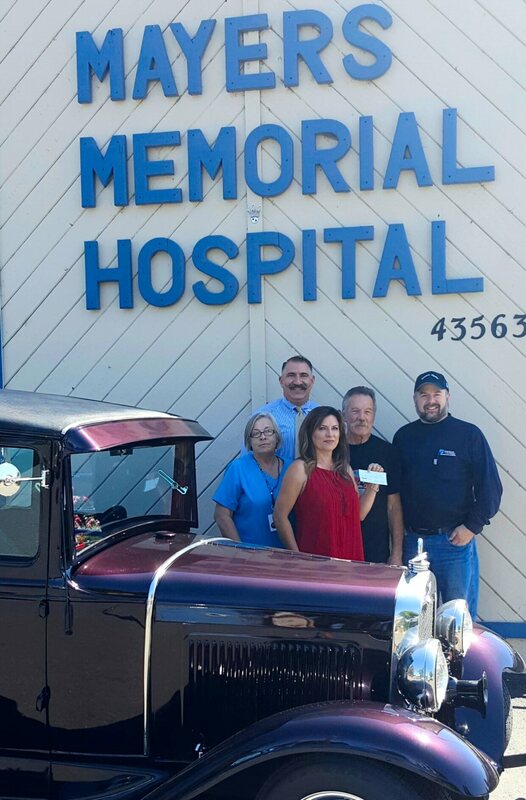 The Mayers Intermountain Hospice has received a generous donation from members of the Norcal Road Gypsies for the third consecutive year. The group presented a check for $3000, the proceeds raised at their annual car show. The car show which featured 82 cars was hosted by the club on July 17th at the Clearwater Lodge. Car club co-presidents Greg Gordon and Bob Eastburn said the club loves to support the great work that Hospice does in our community. “I have personal experience with Hospice, they do great things for people at a time that it is needed the most. “ Said Gordon. Another donation will be forthcoming in Gordon’s name. As an employee of PG & E, the company will be contributing $350 donation to Hospice for Gordon’s community service and time committed to the community project. Eastburn and Gordon also noted that the “just host the event” and the local businesses and community make it a success with donations, support and attendance. Mayers Intermountain Hospice provides a special kind of care and support. Hospice helps patients and their families with decision making, meeting life goals, enhancing family relationships and promoting comfort. The Hospice team is available 24/7 with dedicated on-call teams and Hospice trained volunteers.